Yes, I’m going to talk about it. Race. Last week, I took my teenaged daughter to see the classic ballet, Swan Lake. This was our first time seeing it, and we were both giddy with excitement. The auditorium was packed, dotted with little girls in velvet dresses and lithe, young dancers. When the ballet begins it is everything we hoped for; beautiful music, gorgeous costumes and breathtaking dancing. But when the Swan Princess enters, we lean in a little closer for a double take—she’s Asian. We look at one another with understanding, she looks like us! In the traditional world of ballet, having anything different than a white prima ballerina is unusual and exciting. I have a lot of complication. Although I was born in Korea, I came home to Minnesota to have a classic Midwestern childhood with a family of German descent. (Minnesota has the highest Korean adoptee population in the nation.) I ate Tater Tot Hotdish, drank cherry Kool-Aide and was a cheerleader for the football team. I grew up All-American because I am. Does this make me less Asian? Who decides what ‘being Asian’ means? These are the questions I have never had solid answers for. What I do understand, is what it is like to be the only person in the room who is not white. This has been the usual experience for most of my life. Most recently, I was at an event celebrating the retirement of a Columbia Heights officer. Across the room, a man is clicking away on his SLR camera. He is energetic and friendly with his subjects, a shock of white hair contrasts greatly to his dark skin. Eventually, I make my way towards him. His name is Phil and when I assume he is the event photographer, he laughs pleasantly and tells me, he is not. Photography is simply his passion and he’s done it all over world. When I share I am running for Anoka County Commissioner, his excitement is obvious. This throws me off. I redirect the topic to the issues I think are important and ask him to share his views. He talks about how things have changed since he moved to Columbia Heights 30 years ago, “At first, there was not much diversity, but now there are many different cultures here, many different cultures, isn’t it wonderful?! And now there is a person of color running!” He is so jolly and heartfelt, I cannot help but be swept up in the enthusiasm. We take a picture and part ways. At first, I didn’t fully understand Phil’s pleasure in my race. Then I remembered Swan Lake with my daughter and the excitement in seeing a version of ourselves represented in a significant role. Even though I don’t put too much stock in what I look like, as a potential elected official, others may. Being represented in leadership is a human need that isn’t always available. Whether it’s gender, or race, or any other kind of descriptor we have for ourselves, having representation gives us a sense of pride and hope. Through others, we see how we, too, might break barriers to achieve new goals. 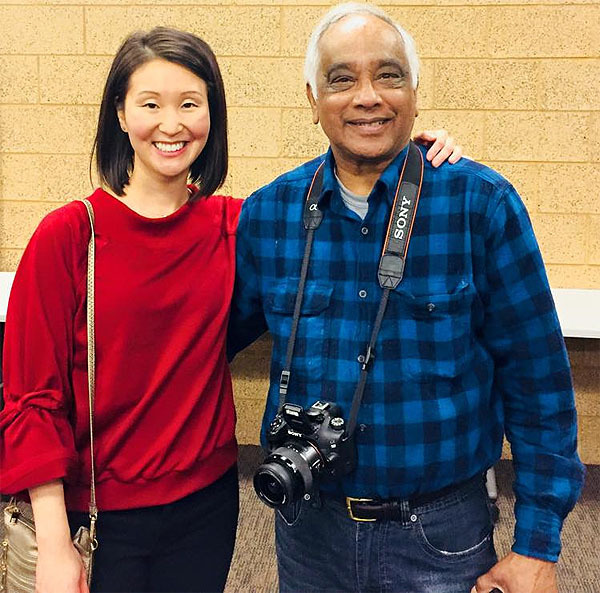 Win or lose in November, seeing Phil’s excitement in having, as he says “a person of color”, run for office inspires me to represent all the parts of me well: An All-American Asian woman who lives in Anoka County.